Enstar Natural Gas is asking state regulators to extend a surcharge paid by Homer area ratepayers to pay for a natural gas line extension installed in 2013. Kenai Peninsula governments are considering pushing back. When Enstar brought natural gas to Homer and Kachemak City, the state paid for most of the work. But Enstar invested $3.6 million of its own money and levied a surcharge to pay back what it considered a loan. But the utility underestimated consumption. Instead of customers paying down the loan, the outstanding balance has ballooned to $2.2 million. Payments have no kept up with the interest that Enstar has been charging its own customers: 11 percent. Regulators approved this as the utility’s accepted rate-of-return. In February, Enstar submitted a new plan: locking in the current monthly surcharge over the next 30 years and to pay itself 6 percent interest on the outstanding debt. But the City of Homer’s Mayor Ken Castner doesn’t think it would work. Residential ratepayers are already paying on average $90 a year. Businesses pay even more. The city projects that southern peninsula customers would wind up paying Enstar $11 million in all. “We made some comments about the appropriateness of the tariff, cost of the allocations. We made some comments about something called retroactive ratemaking, which reaches back into the process and tries to change it after the fact,” Castner explained. Enstar spokeswoman Lindsay Hobson said the company isn’t able to calculate the final dollar amount customers would pay at the end of the 30-year term. The company claims there’s too many variables. For now, regulators have put Enstar’s request on hold. They’re calling a new round of hearings and the state’s Attorney General’s office is also getting involved. The Kenai Peninsula Borough Assembly is also considering jumping in. Interested parties – including the City of Homer – have until April 22 to intervene. Hobson said that’s all part of the process. “By no means is that giving any inclination as to the commission’s position. They’re merely opening up the filing for a docket, for the docket and the investigation,” she said. In the past Enstar asked the regulatory commission to solve this by expanding the surcharge to ratepayers statewide; the RCA’s said no. Expect more back-and-forth between the utility, local governments and public agencies over the latest filing. The RCA is expected to hold public hearings before issuing its final ruling in November. 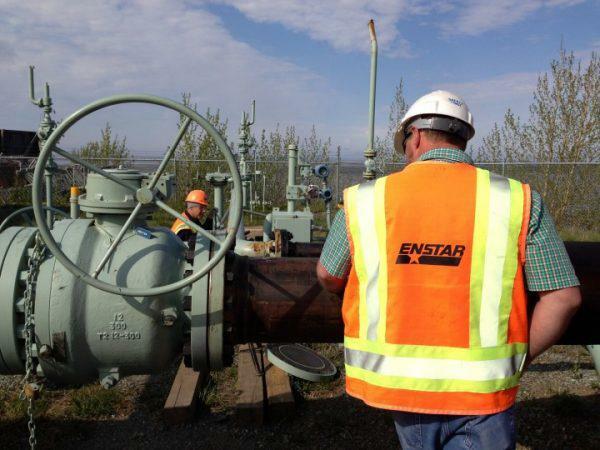 After roughly three years, Enstar Natural Gas is returning to the Regulatory Commission of Alaska, which regulates utility rates in the state, to potentially solve a growing problem on the southern Kenai Peninsula. The gas company is trying to restructure how a surcharge on customers’ bills is paying back money it spent to bring natural gas to Homer in 2013.